I like to make this as a quick dinner during the week. Kale (especially in its raw form) is packed with nutrients, easy to prepare and tastes really good when paired with other textures and complimentary flavors. For this dish, I made a dressing by reducing some sweet, tangy and salty ingredients with toasted sesame oil and a touch of pomegranate molasses. The introduction of dry-fried tofu “croutons” to the dish adds some heartiness to this perfectly healthy and easy dinner. Whisk the dressing ingredients together in a small bowl. Set aside. Heat some olive oil in a large saute pan over medium heat. Dry-fry the tofu cubes on each side until browned, about 7 minutes per side. It’s not necessary to saute all sides. Reduce the heat to medium-low, then add the dressing to the saute pan and toss the cubes around to coat them. Allow the sauce to reduce slightly until it is bubbly and slightly thick, about 2-3 minutes. Remove the pan from the heat and allow to cool slightly. 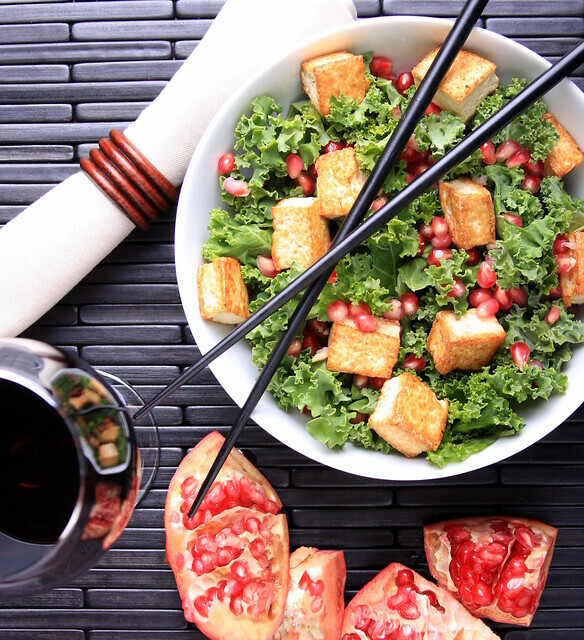 Toss the kale and tofu together, and drizzle the leftover dressing from the pan onto the salad. Top with the pomegranate seeds. What I've read so far sounds SO good, I forgot I'm not vegan! Excellent recipes. Thanks very much — I hope you enjoy some of the recipes!